June 28 is National Tapioca Day. Tapioca, as a starch and thickening agent, is the main ingredient in gluten-free dishes. Tapioca is produced from cassava root. The plant is native to Brazil, but today it is cultivated worldwide. 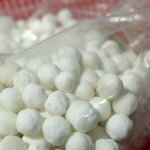 Tapioca can come in different forms: soluble powder, meal, coarse/pre-cooked/fine flakes, rectangular sticks and pearls. Every form of tapioca is used in cooking. Tapioca is mostly associated with tapioca pudding. You can use flakes, meal, sticks and even pearls to make it. Tapioca pearls are mostly used to make bubble tea, which is very popular in cities with large Asian population. Tapioca flour is great for baking bread, that is why it's widely used by people on gluten-free diet. By the way, be careful, because some kinds of tapioca flour contain wheat flour. Canadians found one more way to use tapioca in culinary dishes. Brand Daiya uses it as cheese substitute. Vegan cheese made of tapioca is popular among vegans and people who can't consume diary products because of lactose intolerance or milk allergy.